A simple, classic puzzle is to give two shapes and ask if there is a way to cut one up so the pieces can be rearranged into the other. This game might seem to become silly if both shapes are the same; if we insist that the new arrangement must be different the game becomes interesting again. 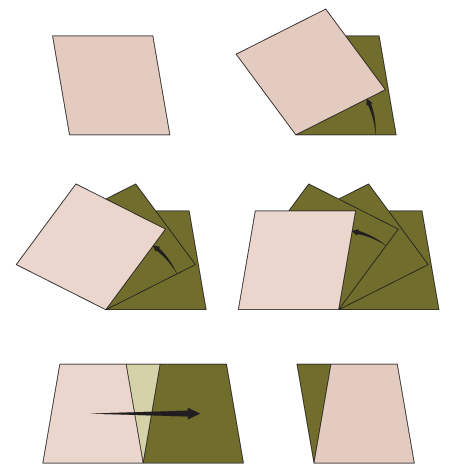 Think about it, can you come up with ways to cut up a square so that the pieces can be formed into two different squares? Here is an example, not with a square, but with a rhombus: Having the same shape has an advantage. Think about the letter p below, it is part of the blue trapezium, when we rearrange the tiles the p moves with the shape. 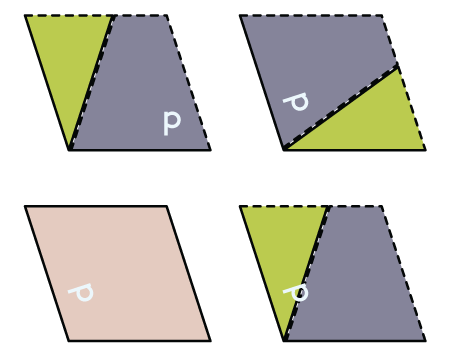 As the two shapes are the same we can think of this new p within the original rhomb. We can now repeat the process as many times as we want. In this case, it might be a little unsatisfying, however, as the next step for our p would cut it into two different pieces, as it lies on the edge. So where is it safe to put a p so that it will never get cut up? 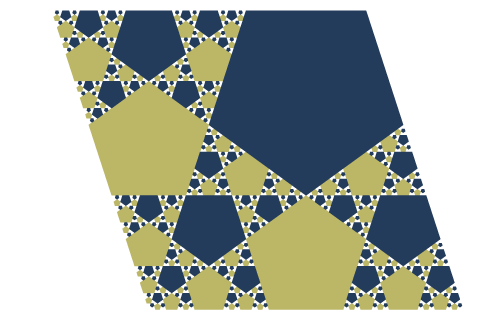 To answer this we have to follow the cutting lines, and a beautiful pattern emerges: The p would be safe within any of the pentagons, but if it crosses any of the edes it will, eventually be cut apart. Puzzle: Can you work out the difference between the green and the blue pentagons? (Hint: it relates to the dotted and solid lines in the earlier pictures). Studying what happens when we can move points or objects around in a space (in this case moving p around a rhomb) is studied in a part of mathematics called Dynamical systems the particular example here is called a Piecewise Isometry (see this paper for a more formal account of their history and study). I have studied these systems myself, and recently submitted a paper looking at the behaviour and number theory that occurs within the pentagon generating system shown above (take a look! It has lots of pictures as well as more formal mathematics). Beautiful! 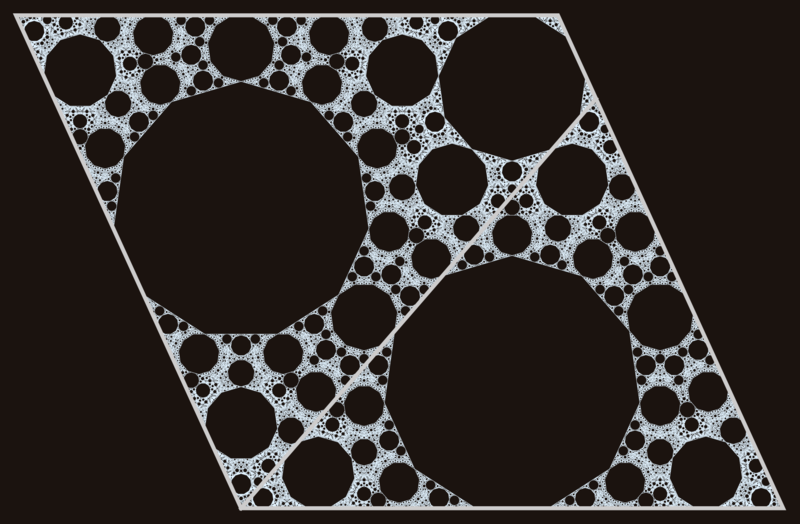 I love it when math leads to aesthetic beauty. Thanks for sharing this. Dear all, please have also a look at our lighting projects for Rotterdam. a three dimensional system projects a lightspace. On the website you find earliers works like the Eudlidean projection. This is a three dimensional projector projecting lines in three dimensions. They then form a grit and define a new pace within a excisting space.